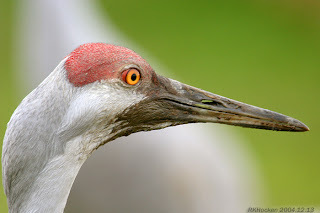 Sandhill Crane: Ralph Hocken Photo. The Sunday bird walk went to Neck Point Park in Nanaimo. The morning was mostly sunny and warm with a breeze off the Strait of Georgia. The highlights included seeing large numbers of Pelagic and Double-crested Cormorants throughout the morning. There were several Red-breasted Nuthatch and Chestnut-backed Chickadees high in the trees along the trails. Canada Geese, Harlequin Duck, Double-crested Cormorant, Pelagic Cormorant, Spotted Sandpiper, Western Sandpiper, Black Turnstone, Turkey Vulture, Great Blue Heron, Mew Gull, California Gull, Glaucous-winged Gull, Eurasian-collared Dove, Belted Kingfisher, Northern Flicker, Pileated Woodpecker, Chestnut-backed Chickadee, Red-breasted Nuthatch, Brown Creeper, Bewick's Wren, American Robin, Northwestern Crow and Pine Siskin. A Sandhill Crane was seen and photographed along the mouth of the Little Qualicum River north of Qualicum Beach. There was a possible sighting of a Red Knot across the Little Qualicum River in front of the two large driftwood trees. Bonaparte’s Gulls, Glaucous-wing Gulls, Least Sandpipers, Western Sandpipers were seen on a gravel bar at the Little Qualicum River Estuary. Large numbers of Barn Swallows and Northern Rough-winged Swallows, were seen hawking insects over the Little Qualicum River Estuary. Six Warbling Vireos and a Yellow-rumped Warbler were spotted along Reed Road in French Creek. A female Black-headed Grosbeak is visiting feeders in the 500 block of Louise Road in Ladysmith. A Northern Goshawk was seen and photographed at Stephenson Point in Nanaimo. Canada Geese, Mallard, Green-winged Teal, Harlequin Duck, Surf Scoter, Common Merganser, Common Loon, Red-necked Grebe, Double-crested Cormorant, Great Blue Heron, Turkey Vulture, Bald Eagle, Killdeer, Black Oystercatcher, Western Sandpiper, Least Sandpiper, Stilt Sandpiper, Mew Gull, California Gull, Glaucous-winged, Marbled Murrelet, Eurasian-collared Dove, Belted Kingfisher, Bard Swallow, Brown-headed Cowbird, House Sparrow were seen at the Little Qualicum River Estuary. A Lewis Woodpecker was seen in a backyard along Telescope Terrace in Nanaimo. Tuesday bird walks have stopped for the summer season. 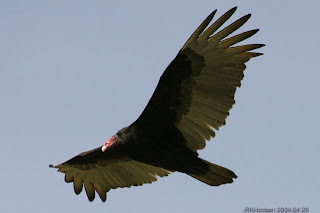 We will resume the Tuesday bird walks on September 04, 2012. Have a great summer. The Sunday Bird Walk on Sunday September 02, 2012 will be going to Bowen Park in Nanaimo. We will meet at the bird store at 9:00 a.m. or the parking lot near the Lawn Bowling green at Bowen Park off Bowen Road at about 9:15 A.M.
*************************************************************************************””Nature by the Salish Sea"
Have you seen these birds? Western Bluebirds (Sialia mexicana) have been released in Maple Bay as part of a species recovery program. These rare native songbirds may be foraging and nesting in your area! We need your help to find them so that we can record their nesting locations and habitat use, and monitor and care for them. Smaller than a robin, about 5.5 inches, with a thin bill. Found in open habitat, pastureland, Garry Oak meadows; perched on fence lines or low branches. Some of the birds are wearing coloured leg bands—please note the colours if you can! To learn more about the Bring Back the Bluebirds Project, see www.goert.ca/bluebird. Please help us watch for Western Bluebirds and contact us immediately if you think you see them: bluebird@goert.ca; 250-383-3427. 2 Common Grackles, Stilt Sandpiper and a Long-billed Dowitcher were seen at the parking area of the Little Qualicum River Estuary off of Kinkad road. Caspian Terns: Ralph Hocken Photo Photo. 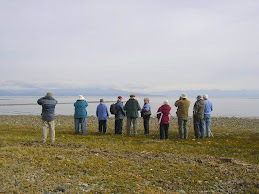 The Sunday bird walk went to the Shelly Road side of the Englishman River Estuary. The morning was cloudy and cool to start, but finished with bright sunshine. The bird of the morning was a Long-billed Curlew-- a shorebird not normally found in this area. We had long views through the scopes at the Curlew as it was feeding along the shoreline across the estuary in front of the Art Gallery at the end of Marina Way in San Pariel. The Long-billed Curlew is a resident of Southern and Interior B.C. and the prairie provinces of Alberta and Saskatchewan. An American Kestrel was perched on a large root not far from the Long-billed Curlew. We also saw a Merlin, an Osprey, a Northern Harrier, a Cooper’s Hawk and a Bald Eagle during the morning. Canada Goose, Mallard, Green-winged Teal, Common Merganser, Great Blue Heron, Common Loon, Pigeon Guillemot, Doubled-crested Cormorant, Turkey Vulture, Bald Eagle, Cooper's Hawk, American Kestrel, Osprey, Merlin, Northern Harrier, Killdeer, Black-bellied Plovers, Spotted Sandpiper, Long-billed Curlew, American Dipper, Purple Martin, Barn Swallow, California Gull, Glaucous-winged Gull, Northern Flicker, Pileated Woodpecker, Northwestern Crow, Common Raven, Eurasian Collared Dove, Band-tailed Pigeon, European Starling, Chestnut-backed Chickadee, Red-breasted Nuthatch , Brown Creeper, American Robin, Cedar Waxwing, Spotted Towhee, White-crowned Sparrow, House Finch, American Goldfinch and Pine Siskin. A Long-billed Curlew was seen feeding for about thirty minutes, on a gravel bar at the mouth of the Englishman River not far from the Art Gallery. Harlequin Ducks, Black Oystercatchers, California Gull, Ring-billed Gull, Glaucous-winged Gull, a flock of Common Mergansers, three Common Loons were also seen at the mouth of the Englishman River. A Merlin, Great Blue Heron, Mallard, Canada Goose, Semipalmated Plover, Killdeer, Baird’s Sandpiper, Western Sandpiper, Semipalmated Sandpiper, Least Sandpiper were seen at the San Peril mud flats in Parksville. Three Caspian Terns, California Gulls, Ring-billed Gulls and Glaucous-winged Gulls, Black-bellied Plover, Black Turnstone, Parasitic Jaeger, Marbled Murrelet, Pigeon Guillemot, Common Raven, Northwestern Crows and four Barn Swallows were seen at Columbia Beach. 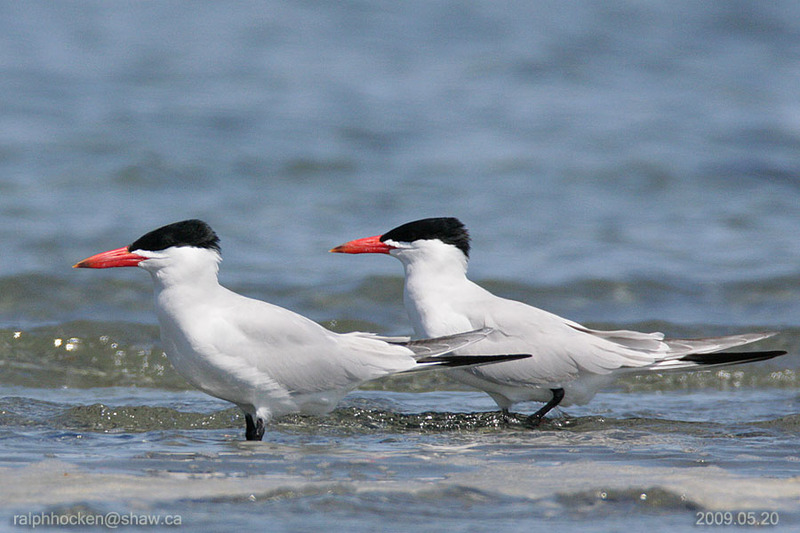 The three Caspian Terns were roosting on a gravel bar to the right and off shore from the ponds at Columbia Beach. The Parasitic Jaeger was seen flying up the Strait of Georgia a distance off shore at Columbia Beach. 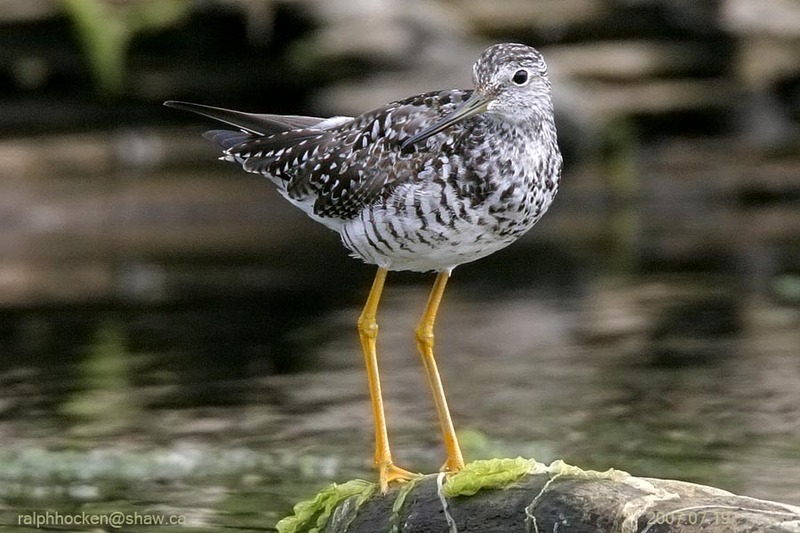 A Spotted Sandpiper was seen at the viewing platform at Qualicum Beach. Five Marbled Murrelets and three Pigeon Guillemot were seen further offshore from the viewing platform at Qualicum Beach. A Orange-crowned Warbler and a Black-throated Grey Warbler were seen in a backyard water stop amongst the bamboo in a backyard in the 6900 block of Lancewood Drive in upper Lantzville. A Chestnut-backed Chickadee halo surrounded the resident when he was filling a the tube feeder. They landed on his arms when he was trying to put the feeder back in an apple tree. Over one hundred Common Nighthawks were seen feeding, strung out over the highway between the Nanaimo airport and the north end of Ladysmith. The Sunday Bird Walk on Sunday August 26, 2012 will be going to Neck Point Park in Nanaimo. We will meet at the bird store at 9:00 a.m. or the parking lot at Neck Point Park off Hammond Bay Road at about 9:15 A.M. The Sunday bird walk went to Beck Creek in south Nanaimo. The morning was sunny and warm. 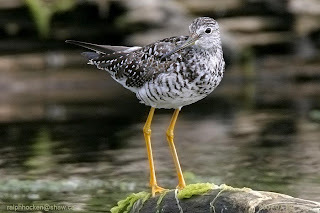 We had great close views of the Greater Yellowlegs as it fed along the creek shoreline. Canada Goose, Mallard, Common Merganser, Great Blue Heron, Turkey Vulture, Bald Eagle, Red-tailed Hawk, Merlin, Glaucous-winged Gull, Mew Gull, California Gull, Band-tailed Pigeon, Eurasian-collared Dove, Belted Kingfisher, Greater Yellowlegs, Northern Flicker, Northwestern Crow, Common Raven, Purple Martin, Violet-green Swallow, Brown Creeper, Chestnut-backed Chickadee, Red-breasted Nuthatch, Brown Creeper, Bewick's Wren, Bushtit, American Robin, Cedar Waxwing, Western Tanager, Spotted Towhee, Song Sparrow House Finch, Dark-eyed Junco. Eight to ten Common Nighthawks were seen in a feeding frenzy over Chase River in south Nanaimo. A flock of Common Nighthawks were seen circling over Temple Street in Parksville. A flock of Common Nighthawks were seen hawking insects above Country Club Drive and Neyland Drive in Nanaimo. American Goldfinch and Pine Siskin were visiting feeders and a Fox Sparrow was seen on the ground along Neyland Drive in Nanaimo. An Evening Grosbeak was seen in the 5200 block of Colbourne Drive in north Nanaimo. One female and two fledglings Pileated Woodpeckers were seen along the Cougar Trail Road in Nanaimo. A female Hairy Woodpecker along with a female and a fledging Pileated Woodpecker, a pair of Song Sparrows feeding a Brown-headed Cowbird were seen at the Pacific Biological Station along Hammond Bay Road in Nanaimo. The Sunday Bird Walk on Sunday August 19, 2012 will be going to the Shelly Road side of the Englishman River Estuary in Parksville.. We will meet at the bird store at 9:00 a.m. or the parking area at the end of Shelly Road on the ocean side of highway 19a in Parksville at about 9:20 A.M.
"Nature by the Salish Sea"
The Sunday bird walk went to Legacy Marsh in upper Lantzville. The morning was sunny and warm. We saw five Cedar Waxwings hawking insects from high up on a Fir Tree just off the road, giving us great views. Four Turkey Vultures circled overhead for most of the morning. We heard a flock of Purple Martins overhead. Sharp-shinned Hawk, Turkey Vulture, Northern Flicker, Willow Flycatcher, Western Wood-Pewee, Common Raven, Northwestern Crow, Barn Swallow, Purple Martin, Chestnut-backed Chickadee, American Robin, Cedar Waxwing, Common Yellowthroat, Spotted Towhee, Song Sparrow, Dark-eyed Junco, American Goldfinch and House Finch. Ten to twelve Common Nighthawks were seen circling over the end of Wren Place in Nanaimo. A Barred Owl was seen and photographed along the Englishman River Estuary in Parksville. Twelve Common Nighthawks were seen heading south over the 500 block of Louise Road in Ladysmith. Over twenty-four Common Nighthawks were spotted hawking insects over a house along Marlborough Drive in Nanaimo. Fifteen Common Nighthawks were seen flying high above the Craig Street Market in Parksville. A Pied-billed Grebe was on it’s nest in the marsh at Buttertubs Marsh in Nanaimo and a Merlin was seen feeding from the surface of the marsh. Saturday, July 28: A Black-headed Grosbeak was seen visiting feeders along Lost Road in Nanaimo. A male Painted Bunting has been reported at a birdfeeder in Ucluelet, on the west side of Vancouver Island. The Sunday Bird Walk on Sunday August 12, 2012 will be going to Beck Creek in south Nanaimo. We will meet at the bird store at 9:00 a.m. or the parking area near the entrance to Living Forest Campground on Maki Road at about 9:20 A.M.